I don't make glass beads. My less than stellar lab experiences with melting glass ampoule stems and capillary tubes pretty much put me off the technique! That's why I am in awe of lamp work bead artisans who can make really beautiful beads. It's not easy staring at flames and trying to maneuver molten glass which has the consistency of treacle or molasses! After watching or reading about these demos, I admire their skill even more. If you have never seen a lamp worker in action, then these how-tos will be worth a look. Who knows? You might even sign up for lamp work classes! Shown above are the adorable polar bear beads created by Chris Mode of The Creative Mode. The video shows such deft strokes to create the little eyes, nose and scarf! Roger Child's video is actually a tutorial on how to make a lamp work hummingbird. Watch how he pulls and flattens the tail with his pliers. The wings are formed by repeatedly folding and pulling the molten glass. Just masterful! Kim Nelson's Funky Flower Bead video shows the utter steadiness and even turning needed while forming and adding colors. She uses a pair of scissors to cut the half molten glass to make the petal effect. Water beads are translucent beads with surface textures reminiscent of ocean waves. Instructor Kate Drew Wilkinson demonstrates in her How to Make a Water Bead video the basic steps. It looks to be a forgiving technique as the swirls do not have to be exact. 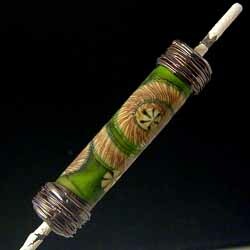 I am in awe of anyone who can create lampworks ... it is such an amazing talent! Maneuvering molten glass to make such intricate designs?! hats off to anyone who can! It is a truly amazing art and watching a glass artist creating is like watching magic in action. Very impressive how they can take a rod of glass, heat it red hot and transform it into something so wonderful as a hummingbird, polar bear or cute little flower.